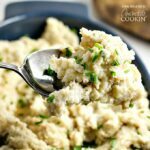 You don’t need to forget about your favorite mashed potato recipe, just amplify the flavor of this side dish with browned butter! Brown butter mashed potatoes are positively delicious. 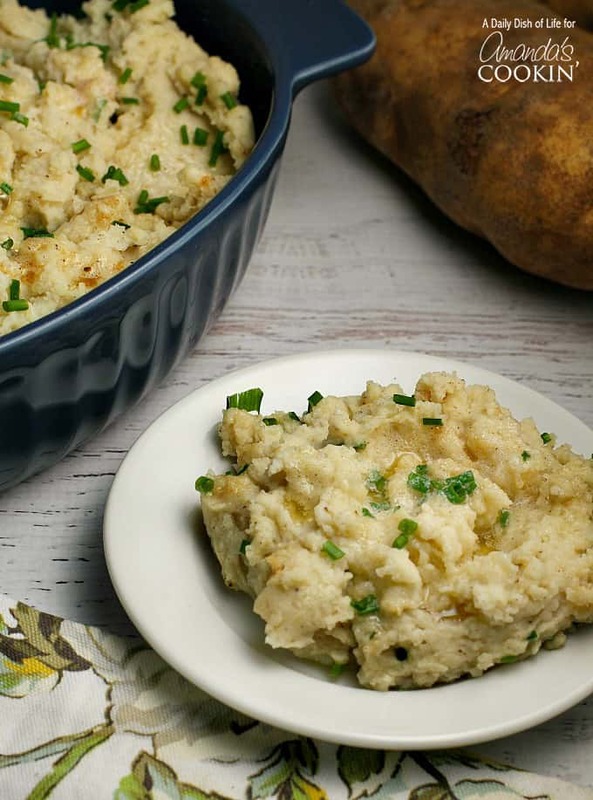 Get perfect mashed potatoes every time with these foolproof tips! It’s mashed potato season! 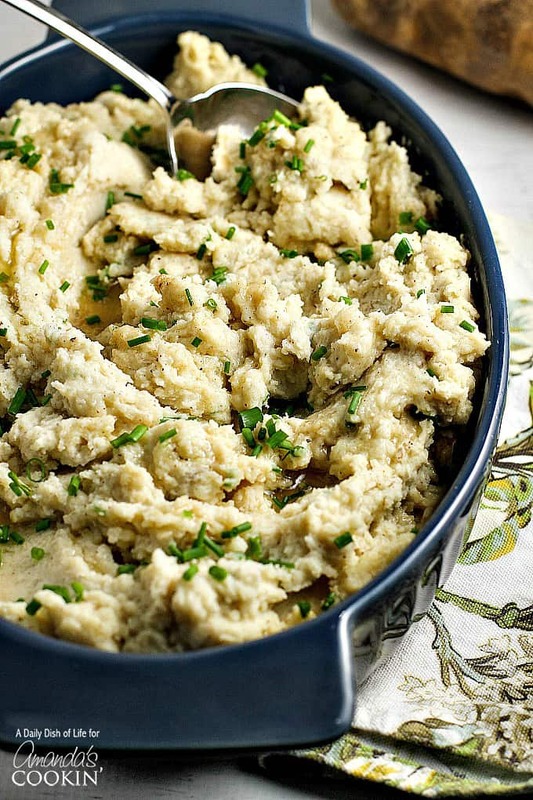 Thanksgiving dinner just isn’t complete without a side of mashed potatoes. But for a recipe that takes very few ingredients, mashed potatoes can be tough to master. Use the wrong type of potatoes, and they can be lumpy and dry. Mash them the wrong way and they can feel glue-like. So today, I’m going to share with you how to get the perfect brown butter mashed potatoes every time. Go with a starchy potato like Russet or Yukon Golds. The waxy potatoes don’t break down as well, and they don’t absorb dairy as well either. Food mill, potato masher, or food processor? The light airy feel you’ll get from putting your potatoes through a food mill gives your mashed potatoes the perfect texture. Plus it removes your skins for you. Using a potato masher would be my second choice. You definitely don’t want to use a food processor. It will give your potatoes a glue like texture that just doesn’t taste right. Browning your butter is a simple way to add another flavor dimension to your mashed potatoes: hence the need to tell you about these brown butter mashed potatoes. When your butter melts, it will start to foam and change color. Make sure to use a light colored pan so you can see the color change. Once you see those little brown flecks appear (not black! ), your butter is done, and you’ll want to remove it from the heat. When you’re adding the butter to the mashed potatoes, try to avoid transferring that brown fleck sediment to your potatoes if you can, but if a little gets in, it’s not a big deal. The brown butter will add a golden tinge to your mashed potatoes. Scrub your potatoes and place them in a large pot. Add enough water to cover the potatoes, and salt the water. Bring the water to a boil and cook until tender, about 20 minutes or so. You should be able to put a knife all the way through the potatoes when they’re done. Drain and cut the potatoes into chunks. The skins will be falling off a little…you’ll probably be able to tear off the bigger pieces. Put potatoes through a food mill to get an airy texture to your mashed potatoes while it strains the rest of the skins out. Brown your butter over medium low heat. Use a light colored pan so you can keep an eye on the color, because you don’t want to burn the butter. As soon as you start to see little brown specks appear, your butter is done. 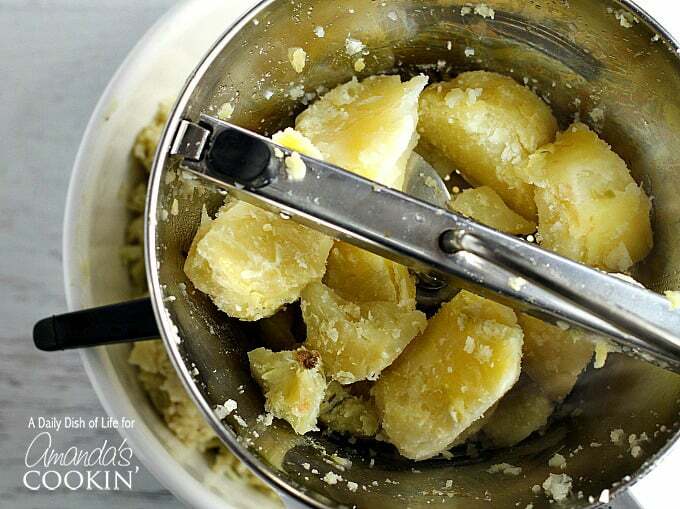 Add most of your butter and warmed light cream to your potatoes and mix together. 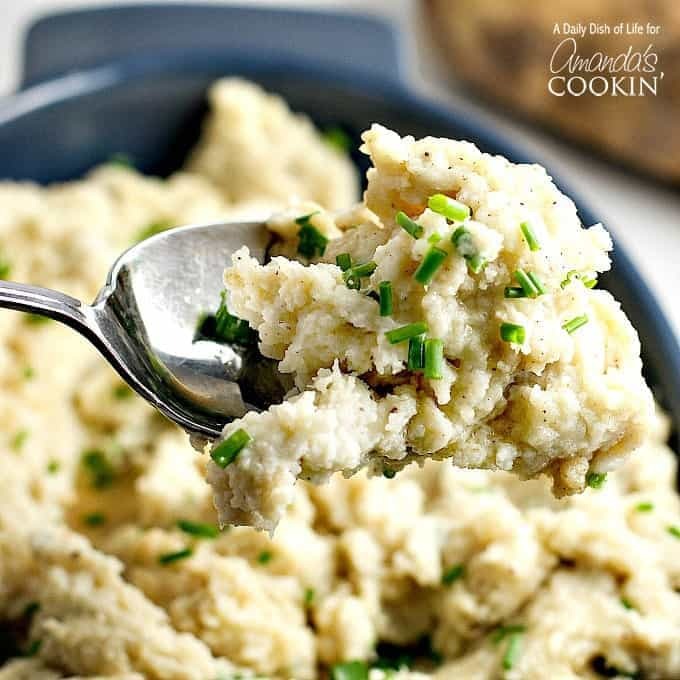 Save a couple of tablespoons of the browned butter to add to the mashed potatoes at the end, and top with chopped chives. Thanksgiving is one of my favorite holidays. 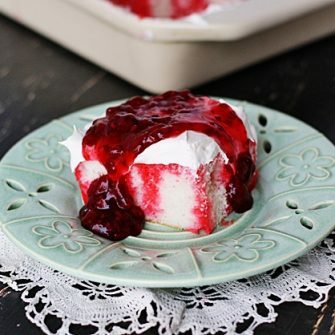 Every year I make this French Silk Pie, some whole cranberry sauce, my homemade pull-apart dinner rolls and this Cranberry Relish. Here are several more of my holiday favorites. My daughter is a huge sweet potato casserole fan, and this gorgeous version has an oatmeal cookie topping! I’ve always loved green bean casserole, but I’m not a fan of condensed soup. This homemade version is so much better! 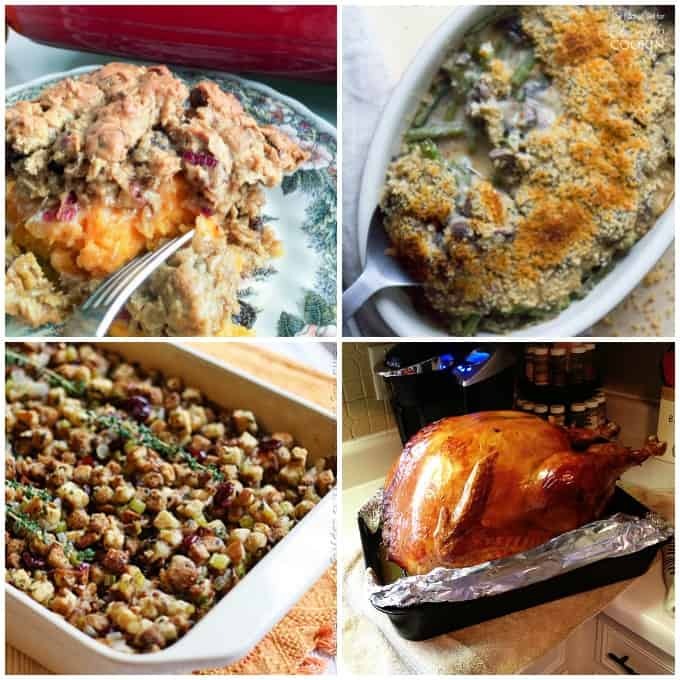 Don’t forget the homemade stuffing! This dressing recipe includes several wonderful herbs to tempt your tastebuds. Every single Thanksgiving I brine my turkey. It comes out moist and delicious every single time! Her’s exactly how to brine a turkey this year. Scrub your potatoes and place them in a large pot. Add enough water to cover the potatoes, and salt the water. Bring the water to a boil and cook until tender, about 20 minutes or so. You should be able to put a knife all the way through the potatoes. Drain and cut potatoes into chunks. The skins will be partially falling off...you'll probably be able to tear off the bigger pieces of skins. Put potatoes through a food mill. It will give you an airy texture to your mashed potatoes, while straining the rest of the skins out. Brown your butter over medium low heat. Use a light colored pan so you can keep an eye on the color. As soon as you start to see little brown specks appear, your butter is done. Add most of your butter and warmed cream to your potatoes and mix together. 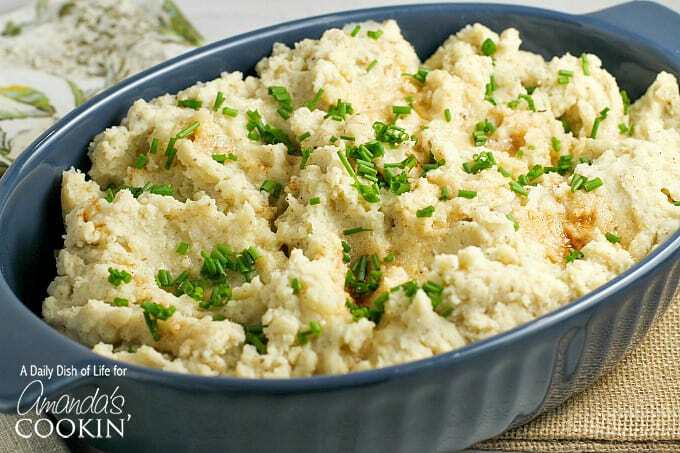 Save a couple of tablespoons of the browned butter to add to the mashed potatoes at the end, and top with chopped chives. As a true brown butter lover, I am totally baffled as to why I’ve never thought to try brown butter potatoes! The perfect touch of richness! Mashed potatoes are my favourite and I must try your brown butter receipt, it just looks so tempting.